Not much to say really. If you enjoy the institution of the public post office, maybe you'd consider using it a bit more this holiday season. You know what they say...use it or lose it. "Lose the dog. It only makes you look silly. YOU JUST DON'T GET IT DO YOU?!?!?" No I don't get it mister. Thanks to Mark for posting this wonderful pic of the DORK tag that I sent him. He managed to find a sublime place for it's new home. I hope to be inspired and post something soon. I missed the cut off for the Tehran "It's yours take it" event, so am bummed, but maybe I'll get something else underway. 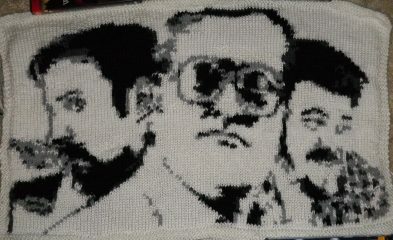 I happened upon this wonderful sight originally through the Yarnbombing page, but had to return to check on the progress of this fantastic Trailer Park Boys piece. It's also an exercise in breaking out your interpretive skills, or so I found when I was facing 4 shades of grey and my own instincts, which I mostly don't give enough credit. I had to send an enthusiastic shoutout to Knitified for this. I have really not been doing much new stuff for the streets. I did manage to hammer something up a couple of weeks ago, but mostly, have been working on socks. I can't sit still, so socks it is. And as I've nearly finished a pair already, I can see how addictive they might become. I have much to aspire to. Check out these mad skillz. Plus this gave me another excuse to post my Magnum Opu, to this day, which is the shoutout to Redrum. It's sad that I gave it away, but I know that he loves it, so that makes me feel good. ...and now to finish my socks and reknit the ripped off Olympic symbol. There was a lively turn out for the DIY night at the Museum of Vancouver on Thursday night. It was great to see so many familiar faces, and everyone seemed enthusiastic about knitting, and having a bevvie. Definitely, one of the stars of the show was this ball of Woodward's Sport Yarn. More than one person exclaimed that it would be travelling home with them in their bag following the event. It was more than ok with me. Check out the mound of yarn that we had to work with. 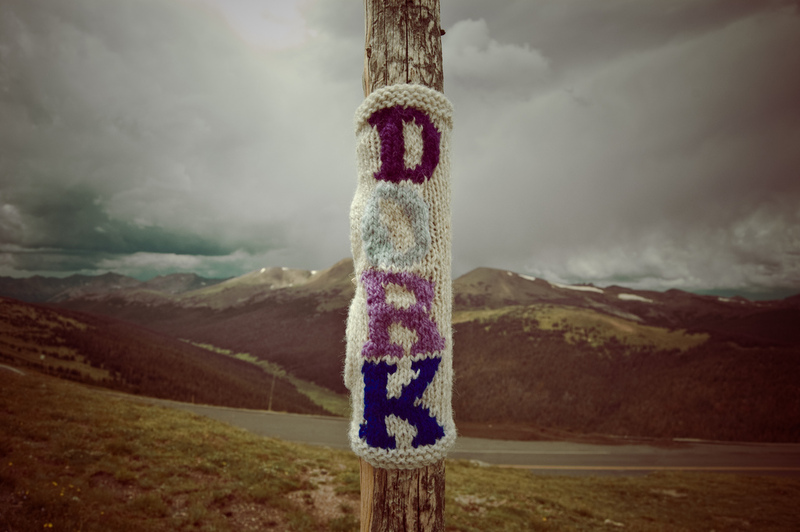 There was even a small, unfinished cardigan that somehow ended up in the giant yarn stash. No one seemed enthusiastic about finishing it though. Can you blame them? The stuff of nightmares, this finishing of other people's half constructed projects. It was also great to see my favourite Yarnbombing ladies Mandy and Leanne. It had been FAR TOO LONG since we'd been in touch. Hopefully we can get together soon!! Thanks to Keith for these couple of photos, and for really giving knitting a go. It is possible for anyone to learn. Or should I say almost anyone. Maybe it's just that I'm not a great teacher, but even casting on was a challenge for me to convey to some people. Maybe it's just my particular method. There must be an easier way than the one I was trying. Thanks to everyone who worked so co-operatively to share their skills with the newbies. It was a good time!! There might even be another event like this in my future. Must check out a new way of casting on before then. I made a protest post it note to tack up the local market. It's like preaching to the converted, but hey, whatever, it was fun. It was also my first foray into embroidery, which was interesting. I don't know that I LOVE it, but I do love the work created by my virtual friend "cauchy09". She has a Spam Stitchery set that is to absolutely die for. And make your own protest post-it message to send to our out of touch Government. In these tough economic times, blah blah blah...has become an excuse for EVERYTHING. This is a Flickr badge showing public photos and videos from knitgirl. Make your own badge here.